"Door County's Best Prime Rib Steak Sandwich located In Sturgeon Bay, WI"
This is a turn of the century stone building built in 1898 originally as The Stage Stop. Friday & Saturday specials after 5:00 P.M.
Four Big Screen TVs to watch your favorite sporting event whether it be football, basketball, baseball, golf, or hockey. Dart leagues for both men and women are held at Greystone Castle. Greystone Castle Bar sponsors stock cars, bowling leagues, softball teams, volleyball teams and others. On Door County snowmobile trail in downtown Sturgeon Bay corridor. 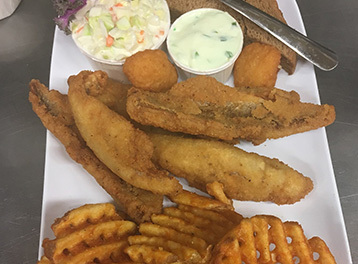 At the corner of Maple and Madison where the two in-town bridges meet in historic and beautiful downtown Sturgeon Bay, Wisconsin lies a multi-generational bar and eatery, The Greystone Castle. Now as The Greystone Castle, owners, Greg and Sue Ebel have presided for 33 years now. The Greystone Castle was remodeled in 1993 after a fire. Ownership is in the form of Greg and Sue; along with sons Wade and Luke. 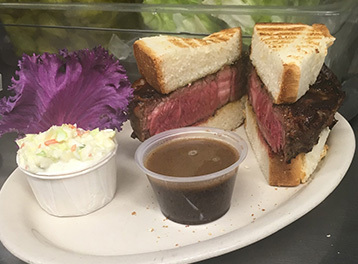 The tradition of fine food and libation has always been a preference of locals and tourists alike especially due to their signature prime rib steak sandwich, burgers, and pan-fried fish. Once inside it appears to be a museum itself for it is the home to Greg Ebel's awesome personal mount upon mount lining the walls. It is a walk "on the wild side" with trophies from bear to boar and salmon to sturgeon. 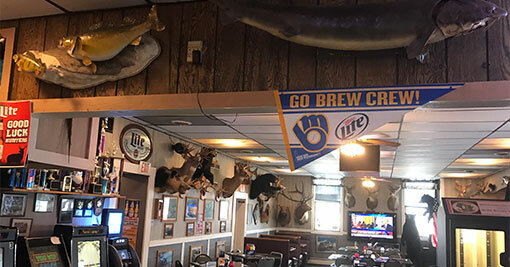 Come in to see the only bar in Sturgeon Bay with mounted Sturgeons. 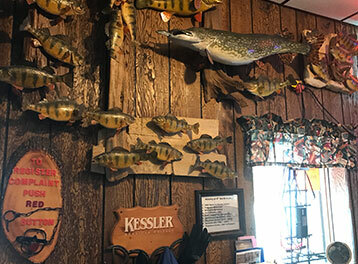 The Greystone Castle sports a lively clientele always willing to give local information on hunting and fishing and definitely the place to hear the origin of the "fish story." It has always been and remains a must-see stop when in Sturgeon Bay. 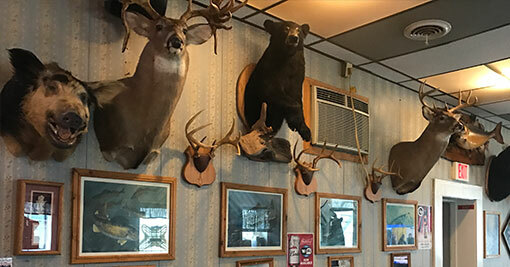 This is where the Hunters and Fisherman Eat, Meet and Greet! We will also deliver nightly. Call your order in in advance! We have a fine selection of beers on tap including a "Delicious Bud Light" and a large selecion of wine. So come to Door County's Greystone Castle for The Best Prime Rib Sandwich in Sturgeon Bay and a delicious Bud Light!